Paul Urbach graduated in 1981 at the University of Groningen in the Netherlands and completed in 1986 a PhD thesis at the same university on the optimization of hydrodynamic propulsion. In 1986, he joined Philips Research Laboratory in Eindhoven, the Netherlands. During 1980 he spend four months in Signetics Research Laboratory in Sunnyvale, California, were he worked on optical lithography. In 1994 he became principal scientist op Philips Research Laboratory. 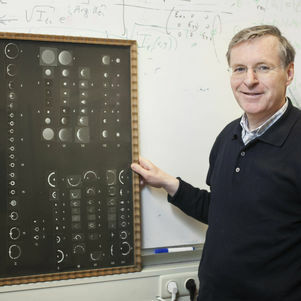 In 2000 he became part-time professor in diffraction optics at Delft University of Technology. Since January 2008 he is full professor and head of the Optics Research Group of TUDelft. Paul Urbach is member of the Optical Society of America, the European Optical Society, the Society for Industrial and Applied Mathematics, the Dutch Physical Society and the Royal Dutch Mathematical Society (founded in 1778). From 1992-1996 he was member of the board of the Royal Dutch Mathematical Society and since 2008 he was elected in the Board of the European Optical Society (EOS). Since autumn 2010 he is president-elect of the EOS. Paul Urbach has done research on many branches of optics, such as optical lithography for ICs and optical disc mastering, x-ray fluorescence, electromagnetic modeling of optical recording, manipulation of spontaneous emission, high numerical aperture imaging, photoactive anisotropic media and plasmonics for application in LEDs . A. da Costa Assafrao, A. J. H. Wachters, S. F. Pereira, and H. P. Urbach. "Near-field self-induced hollow spot through localized heating of polycarbonate/zns stack layer", Appl. Opt., 51(31):7684–7689, Nov 2012. M.-S. Kim, A. C. Assafrao, T. Scharf, A. J. H. Wachters, S. F. Pereira, H. P. Urbach, M. Brun, S. Olivier, S. Nicoletti, and H. P. Herzig. "Submicron hollow spot generation by solid immersion lens and structured illumination". New Journal of Physics, 14(10):103024, (2012).